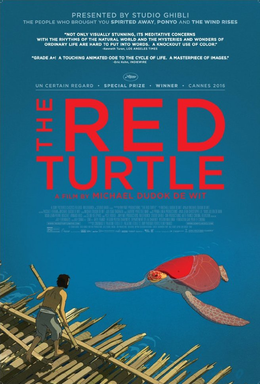 Oscar-nominee and animator, Michaël Dudok de Wit, in his debut feature film ‘The Red Turtle’, brings a visual treat for film enthusiasts at Jio MAMI 18th Mumbai Film Festival with Star. The Red Turtle is a French-Belgian-Japanese animated film co-produced by Wild Bunch and Ghibli Studios. This movie will be screened at the festival this year, as part of the Rendezvous section which celebrates French cinema. The Red Turtle revolves around a man marooned on a deserted island who tries desperately to escape, until one day he encounters a strange turtle that will change his life. The movie was showcased at the Cannes Film Festival on 21st May 2016 where it was nominated in three categories and received the Un Certain Regard Special Prize. This silent movie has received a lot of appreciation from film critics and movie lovers alike. It’s a must watch since it doesn’t follow the conventional norms of movie making and is immersive with its classic animation and engaging music. Michaël Dudok de Wit is a Dutch animator, director and illustrator based in London has directs and animates award-winning commercials for television and cinema. His movie The Monk and the Fish was nominated for an Oscar and has won numerous prizes including a César Award for Best Short Film and the Cartoon d’or. Michaël Dudok de Wit’s most well-known animated film Father and Daughter won an Academy Award, a BAFTA Award, the Grand Prix at Annecy, and dozens of other major awards. The Red Turtle is the first non-Japanese film produced by Studio Ghibli. Studio Ghibli is well known for their productions like Spirited Away and My Neighbor Toroto. According to Vincent Maraval, head of Wild Bunch, he visited Studio Ghibli in Japan in 2008 and met with Hayao Miyazaki (founder of Ghibli Studios). Miyazaki showed him the short film Father and Daughter and asked him to find its director with the prospect of co-producing a feature film. ← M.S.Dhoni The Untold Story Movie Review: Dhoni’s Untold Story….Remains Untold!